I think in the back of my mind, I always knew I was going to end up having a C-Section. But even now, as I’m able to cuddle and kiss my daughter, it feels surreal. 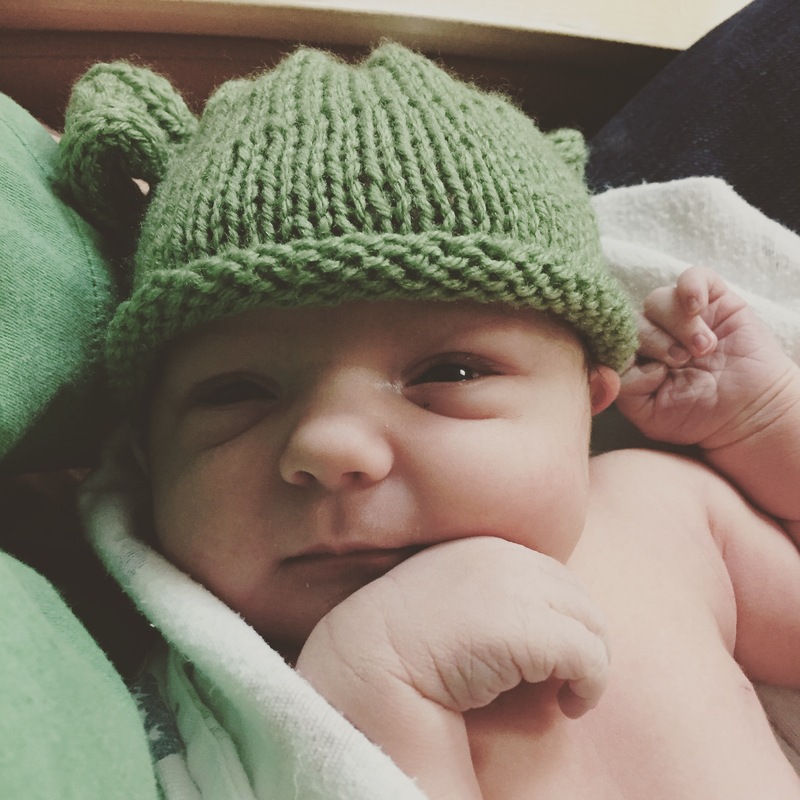 My due date was April 30th, and if you’ve read my previous blog posts, you know that I was really hoping that she wouldn’t come on her due date. I was hoping that she would at least wait till after May 1st so that I could see the Avengers: Age of Ultron (superficial I know, but I’m a fan!). I was really hoping she would be born on May the Fourth for Star Wars Day. While I was able to see the movie, May 4th came and went (but I sure received a lot of Facebook and text messages from friends and family hoping I would have her that day). Even May 5th brought no such luck (it’s dubbed Revenge of the Fifth). 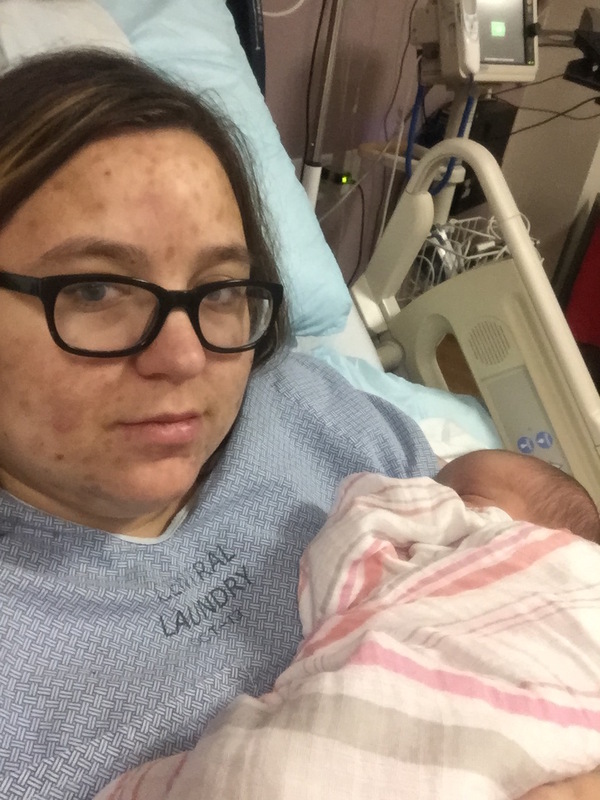 I was getting really down, wondering when I’d be able to hold my little girl, and hoping that my maternity leave wouldn’t be used up by the time she got here. We tried different methods to bring on labor, such as intimacy, long walks, and hot/spicy foods, but Wednesday came and I had an appointment with my doctor. Of course it wasn’t an appointment we really wanted to have because it meant I was overdue and baby hadn’t made her debut yet. I hadn’t made any progress the last few weeks. I remained 1.5 cm dilated and 70% effaced. He said that we next were looking at inducing me and let me know the risk of a long labor and possible C-Section from being induced. I knew the risks and so he had me make an appointment with the receptionist by calling the hospital. I was being induced the next day. When I called the next morning as instructed, they were ready for me to come in right away, so Sean and I left for the hospital. Now, the Friday before I’d actually gone to the hospital for a gall bladder attack that was causing me to have contractions and bad back pain. I’d had a couple other gall bladder attacks during this pregnancy, but this was the only one I went to the hospital for. Because of this attack, I actually felt a little more prepared for when I actually went to the hospital to have my baby. When we got to the hospital, I got checked in and shown to my room. It almost was like I was checking into a hotel, except for this hotel stay guaranteed pain and included going home with a beautiful little baby. I’m looking happy to be here right? After getting changed into the hospital gown, they put two monitors on my stomach, one to check when I was having contractions and one to monitor baby’s heartbeat. They also checked to see if where if I had progressed any in dilating. They found that I was at 3 cm and 80% effaced. Because I’d made some progress, they started me on the Pitocin right away instead of giving me Cervidil. I had to have my IV done twice as the first place was hitting a valve in the vein. I had no idea there were valves in the veins until then. The nurse said we could keep it there but it would just hurt worse later on. I agreed that it would be better to put it in a different spot. I now have a wicked bruise from the first attempt though! The Pitocin started working it’s magic and I could feel the contractions coming on slowly but surely. My family members started arriving throughout the day which helped keep me occupied. They loved watching the contractions on the monitor screen. 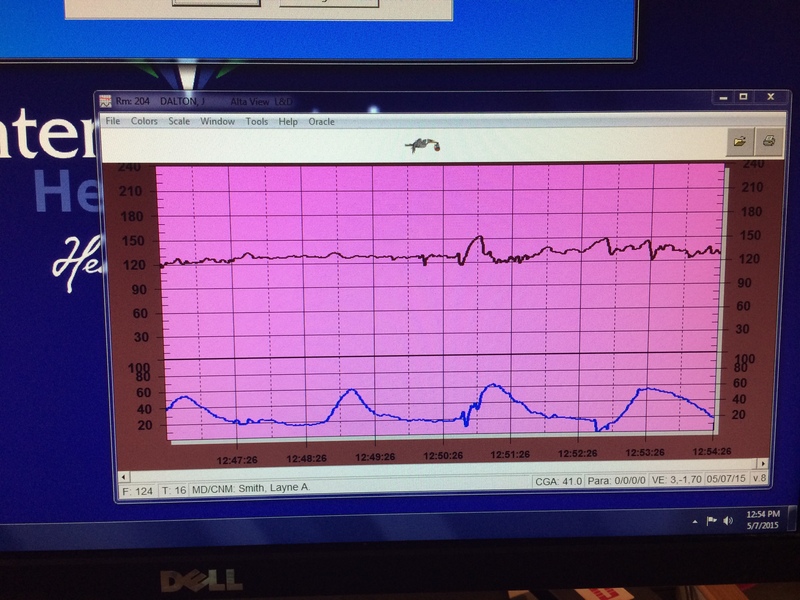 My contractions and baby’s vitals. She kept kicking the monitor away. While everyone else was able to eat whatever they wanted, I wasn’t so lucky. Thankfully they had great popsicles, ice chips (which I loved), and slushies. These were what kept me sane throughout the day as I grew hungrier and hungrier, and all I’d had for breakfast was some toast as it’s all I could stomach that early in the morning. At one point I remember feeling like my water may have broken, or at least started to. My doctor wasn’t in yet, so one of the doctors on site came in to finish breaking it. It was one of the most interested things I’d felt all day. He used the monitor that they were going to put on baby’s head to help monitor her heartbeat better to break the bag of waters. All of a sudden it felt like a faucet was turned on for a few seconds. 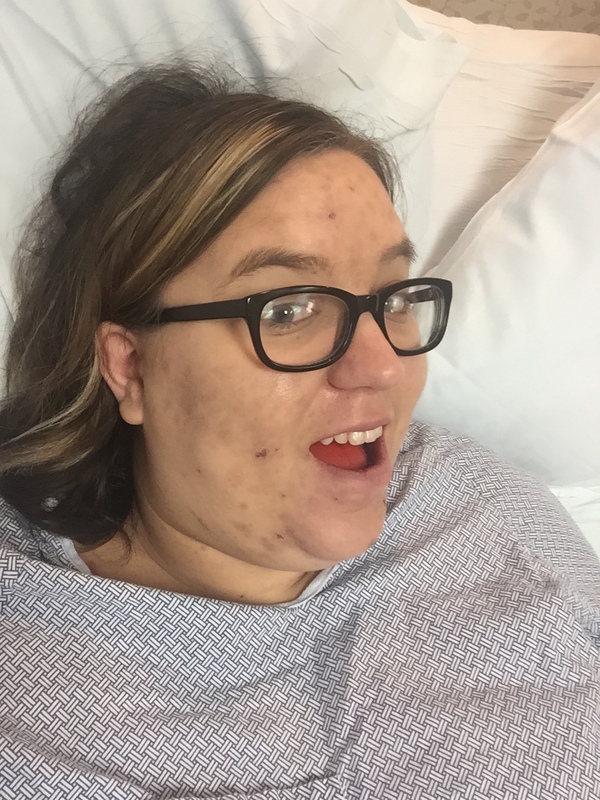 I held off on an epidural as much as I could, but as they upped the dosage of the Pitocin, I knew that if I didn’t get the epidural soon, then I would have wished I’d gotten it sooner. I let my nurse know so that she could alert the anesthesiologist. Because this hospital was a bit smaller than others, I didn’t have to wait long. We had to kick everyone out of the room, except for Sean. I then had to sit up on the edge of the bed and curl my back like a cat. The anesthesiologist pushed on my spine to find the right spot. Because I had some acne on my back, he decided to also give me an antibiotic. He placed a paper thing that helped mark the spot I’m sure (since I couldn’t see it) on my back and then he gave me a local anesthetic. Since I’d had a bit of the local anesthetic for when they put the IV in, I knew sort of what to expect, but I figured this would hurt worse. I was correct. I held onto my knees and breathed deep as Sean coached me through it. It did feel like a beesting, but it mostly had a slight burning sensation. He then put in the catheter that would deliver the drugs and I felt a jolt of lightning in my left leg. That didn’t hurt, but instead made me laugh a little. It reminded me of the feeling you would get when you put your tongue on a battery as a kid. After he was done, the nurse put in a catheter, since I couldn’t get up to use the restroom, and people were allowed back in and I waited for the drugs to settle in. I had to push the button to administer more as it wasn’t working as it should. Once it was, though, I was happy as a clam and didn’t feel any of the contractions. As the day moved on, they kept checking me and I wasn’t progressing as they would have hoped. I was at 5 cm around 3 or 4 PM, I still wasn’t progressing like they wanted me to, so they put another monitor up into my uterous to better measure the contractions. But when they checked again at just before 7, I hadn’t made any changes. This was a cause of concern for my doctor. My doctor came in and talked about options. He said I could continue on with the Pitocin (which they had upped my dosage to above 20, which isn’t normal), but the way I was progressing, my uterus would eventually tire itself out. 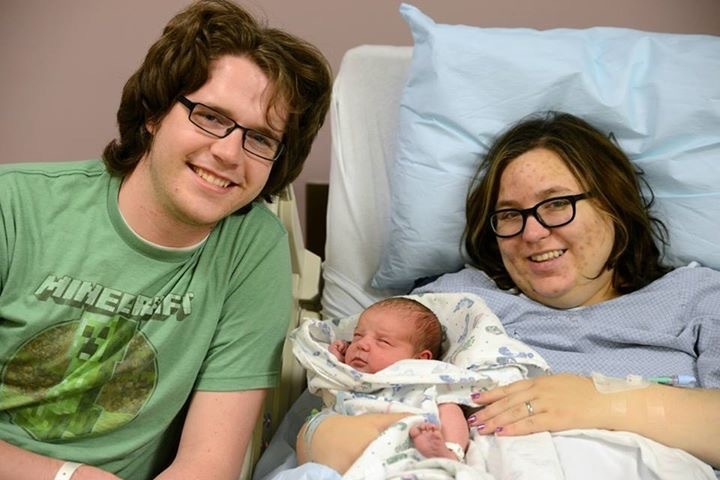 The other option was of course a C-Section, which is what he thought the best option would be. I’m one who tends to agree with medical professionals, especially my doctor. I knew deep down this was the best, though not the most ideal, option. They took me off of the Pitocin and you could tell immediately that the contractions went down and that I wasn’t in true labor. The doctor left me for a moment with my family to take things in, and to see when they could get me in, as there were a number of us girls who came in that day whom needed to have C-Sections. My emotions were running wild. On the one hand, I was okay with the outcome and knew deep down that this was probably how things would have eventually ended up. On the other I felt like a failure, because society has such a negative stigma against having a C-Section. I cried and told everyone I was sorry for crying. My mom told me it was okay. She’d been so great in telling me how proud she was of me all day and how positive I was remaining. Having my family there was important to me for the support and love. My mom suggested that I have the men in my family give me a blessing before I go in, even though Sean had given me one the night before. I knew it would help comfort me and that it was a great idea. It was rather funny when we had to figure out who’s vial of oil actually had oil in it, which my little brother Cody ended up being the winner. I felt at peace as they laid their hands on my head and gave me a blessing. I then had to wait for the anesthesiologist to be done in the OR to come and get me numb from the just below my chest down. 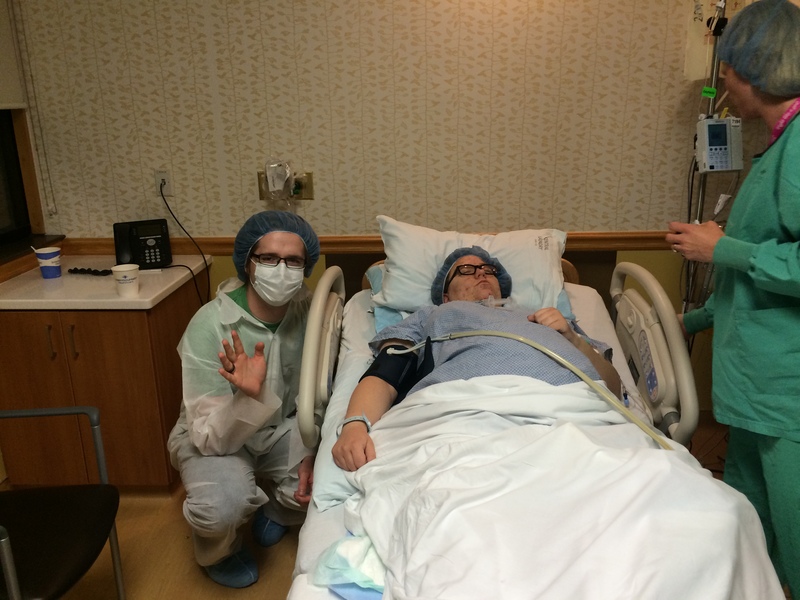 This is why having an epidural can be helpful, as they didn’t have to do any other extra preparations to get me ready for the C-Section. I was told that one of the other girls waiting for a C-Section was in the same position as me, stuck at a 5 and not moving. I told my doctor that I would if she needed it before me, especially if her baby was in dire need. Marvel’s vitals were great so I wasn’t worried about my baby. It ended up that they did take her in before me, so I was the last one for the night. I’m ready too, but out of it. 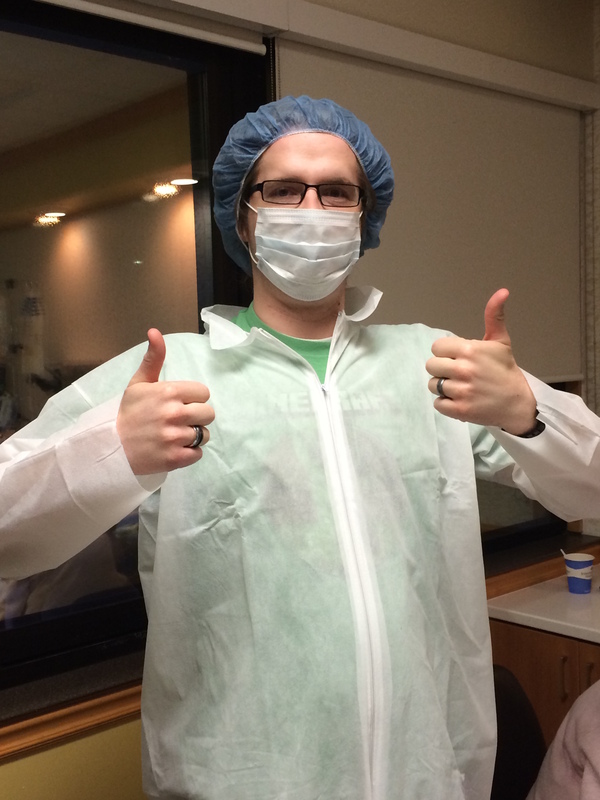 It was finally my turn so they took Sean and I to the OR. He was wearing a clean type suit, little hat, and mask. They also put one of the little hats on me as well, to keep our hair out of the way. They wheeled me down to the room and it all started to seem surreal. I was very nervous as I had never had major surgery before, only small things done in my mouth such as a gum graft and wisdom teeth. This was bigger. I got to the OR and it was very bright with music on the radio. They told me they were going to lift me up and put me on the operating table. Of all the things that could freak me out, this was probably the one thing I disliked most. The table was skinny and it moved side to side so I felt like I was going to fall off, even when they told me they had me. It terrified me. Thankfully, it was short lived as they had me rest my arms on tables or something to help stabilize me. As I lay there, I was reminded of Jesus on the Cross. The doctor asked if I could feel him poking the area where they were going to cut me open, and thankfully I could tell him no. As they prepared me, a Taylor Swift song came on (I believe it was “I Knew You Were Trouble”), and I started to sing along to it. I quickly stopped as they were about ready to start. The next little bit is a blur to me. I don’t remember when they cut me open, but I do remember that afterwards I felt awful. 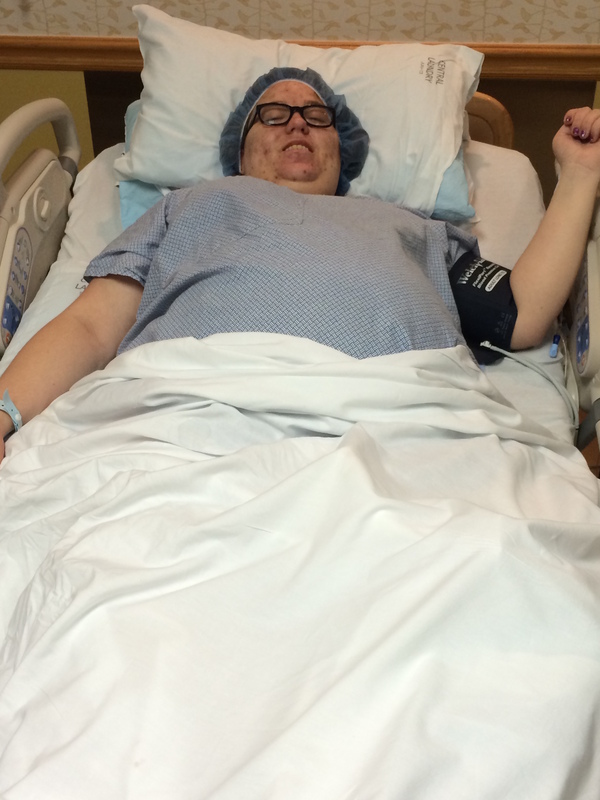 The anesthesiologist worked to get my nausea gone. I felt so sick, thirsty, and hungry. Sean was right by me and held my hand as I complained about those things. I was also shivering as if I were cold, but from what I was told, it’s also a side effect of the hormonal changes in my body. I heard them say my daughter was definitely a girl and that she had a lot of hair, which surprised me, as I was convinced she would be bald like me when I was born. They brought her over for us to see and Sean and I cried (though I was so dried up no tears flowed). My first impressions were how beautiful she was, that she had a scrunchy face (she was crying too), and I couldn’t believe she was actually out! Sean got up to see her again and turned around and saw inside my incision, despite how much he didn’t want to see it. I could also hear the doctor talk about my uterus and how there wasn’t really any muscle in it, which is a lot of why I wasn’t progressing. Later I found out that Marvel’s cord was also wrapped around her neck twice, and that she was big but my pelvis wasn’t. They wheeled me into the recovery room where I learned that my blood pressure was really low and that I’d lost about 1500 cc’s of blood. They needed to get my blood pressure up first before I could hold my baby. I was shivering both because I was cold and from the hormonal changes. Sean left for a little bit to go to the nursery to be with our baby, but then he quickly came back. I was glad to have him with me and at one point asked him to stay by me. At the time, I don’t remember feeling really scared, but I look back and realize how scared I actually was. While I did think about how much I wanted to hold and see my baby, I’m going to be honest and say that the thoughts that consumed my mind were that I couldn’t breath very well (even though the rest of my body dried up, my nose became so stuffed up, I couldn’t breath through the oxygen tube they gave me. I had to have a whole mask put on me instead). I also thought about how thirsty I was with my excruciatingly dry mouth, and that I wanted to know when I was going to be able to eat (thankfully it was sooner rather than later. I was able to eat breakfast!). 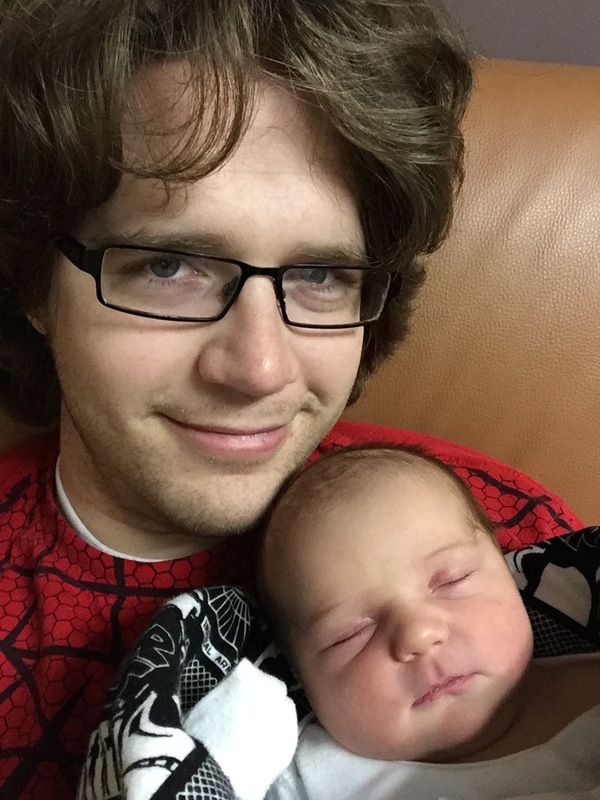 When my blood pressure was finally up enough, Sean asked if I wanted to hold our little Marvel and I couldn’t refuse. I was scared that my shivering would bother her, but her warmth filled me up and I was content. I was so glad to get that skin to skin time that I’d been planning to have. 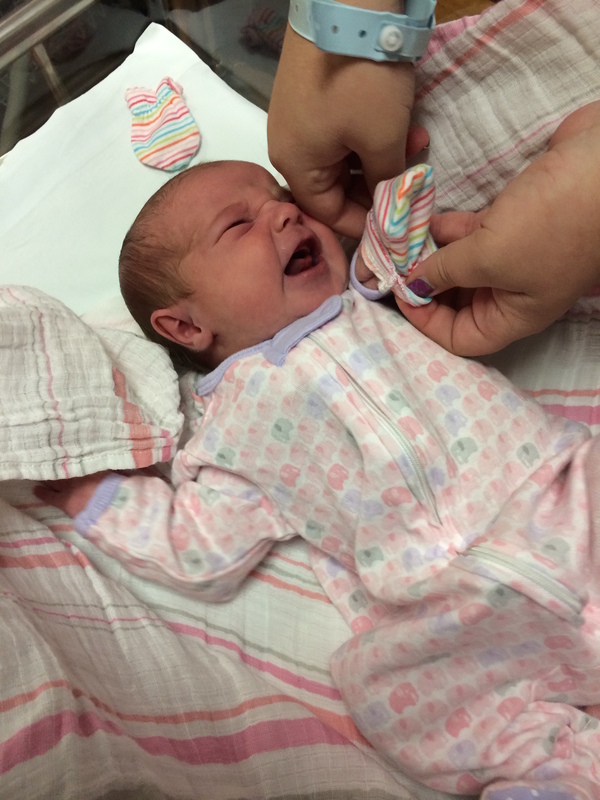 Time moved fast for me, so I didn’t know how late it really was when they finally took me to my postpartum room. Earlier we had noticed that the hospital played a lullaby song in the hallways to announce the birth of a baby. They waited to play it until the mother was leaving to go to her room as it was only heard in the hallways. I choked up as I heard them playing it for me (and even now it makes me cry). Everything was becoming a reality, that after such a long day, I’d finally had my daughter. I got to my room and I started to feed my daughter. Since it was so late, we allowed the women in my family to come in and talk with me and see the baby. It’s amazing how I didn’t really care for modesty at that point and basically bared all for them. I had a pleasant surprise that, again, got me emotional as my sister in law whom I thought wasn’t able to make it was there. I felt that while things didn’t go exactly as planned, some things were falling into place. After feeding her for the first time, we let the men in and we passed her around for everyone to meet her. My brother Cody had made it his goal to hold her before my other brother Jake. I had told him that it was okay, since when Cody was born, I was the first to hold him, even before my mom (how that happened I don’t know, but I tell Cody it’s the reason he and I are so close). I upheld my promise and let him hold her before Jake, but it wasn’t for very long, as Jake had to drive back home about 2 hours, and it was already 1 am. I loved seeing everyone come together in celebration of the birth of our new family member. Everyone agreed with how genuinely beautiful she was (something I’d hear a lot over the next few days). Since it was late, my family slowly left, leaving Sean and I alone. I believe we turned on the T.V. and I texted friends and family before posting on Facebook that we’d had her. I’d made everyone hold off on posting on social media until we’d told everyone, so I made sure to get right on it. I was exhausted but happier than I’d ever been. I didn’t get to go home until Monday, as my blood levels weren’t where they wanted them to be, but they never got low enough for me to need a transfusion. I’m thankful for the amazingly attentive staff at my hospital. I couldn’t thank them enough while I was there. I know that I had Angels in Heaven who watched over me and my daughter during her birth, but the doctors and nurses on staff were my other Angels. It’s been almost 2 weeks now since I’ve had Marvel and it’s taken me almost as long to write this post. 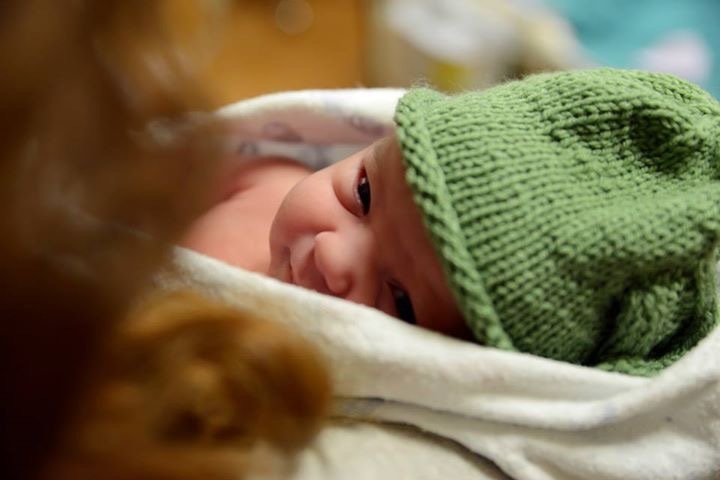 I get emotional when I talk about her birth story for many reasons, but the main thing I take away from it is that I’d do everything all over again for her. When someone asks me if I believe in love at first sight, I know I will be able to answer in the affirmative. 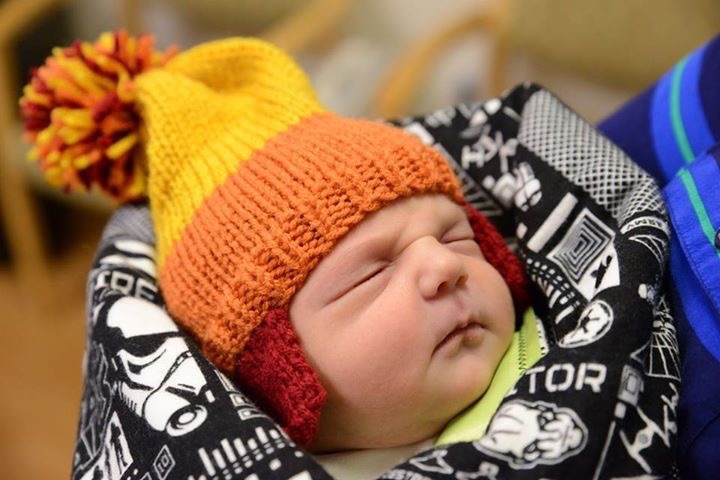 My heart is so full of love for this little human being, and I can’t wait to share the things that I love about this world with her, especially the Geeky side of things.